Almost every month, Flexense releases bug-fixes and product updates for the DupScout duplicate files finder. These product updates are uploaded to our web site and may be applied to any installed product version. Each time DupScout is started, the update manager checks if there is a new product version available. If there is a new version available, the user will see an 'Update' link in the bottom-right corner of the window. In order to manually verify that the currently installed product version is up-to-date, select menu 'Help - Check For Updates' on the main menu bar. The update manager will connect to the update server and check if there is a newer version of the product available for download. If there is a new product version available, the update dialog will show the version of the new product update and two links: the 'Release Notes' link and the 'Install' link. Click on the 'Release Notes' link to see more information about new features and bug-fixes provided by this specific product version. Click on the 'Install' link to download and install the new product version. After clicking on the 'Install' link, please wait while the update manager will download the new product version to the local disk. 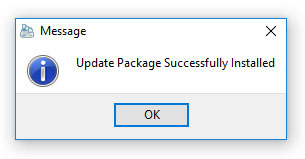 The update package will be downloaded to a temporary directory on the system drive and automatically deleted after the update manager will finish updating the product. After download is completed, close all open DupScout applications and press the 'Ok' button when ready. If one or more DupScout applications will be open during the update, the operation will fail and the update operation will need to be restarted from the beginning. After finishing the update process, DupScout will show a message box informing about the successfully completed operation.